I've seen a lot of fusions come about in the food world but never did I imagine that ramen would get friendly with a burger and pop out a hybrid baby of epic proportions. Meet the Shoyu Ramen Burger. This frankenburger is made up of a prime beef patty glazed with a secret shoyu sauce, nestled between some fresh scallions, arugula and some fresh noodle ramen buns. Because who needs bread when you can fry up some noodles instead? 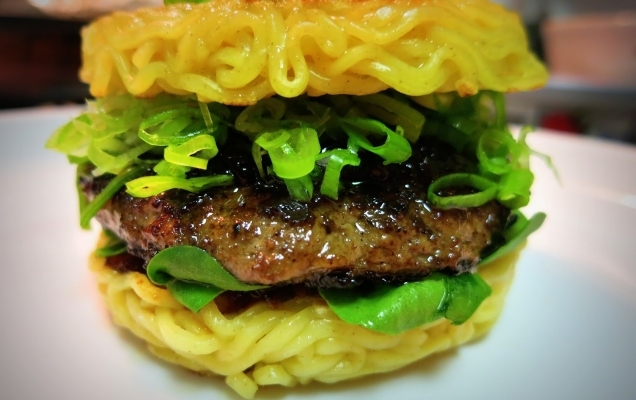 The ramen burger made its New York debut this past weekend at Smorgasborg in Williamsburg, Brookyn. Master creator Keizo Shimamoto perfected these unique burgers back in Tokyo and whipped up 100 of these bad boys for the Brooklyn-based flea market. Ugh, not fair. Howabout we make this a permanent thing, guys?